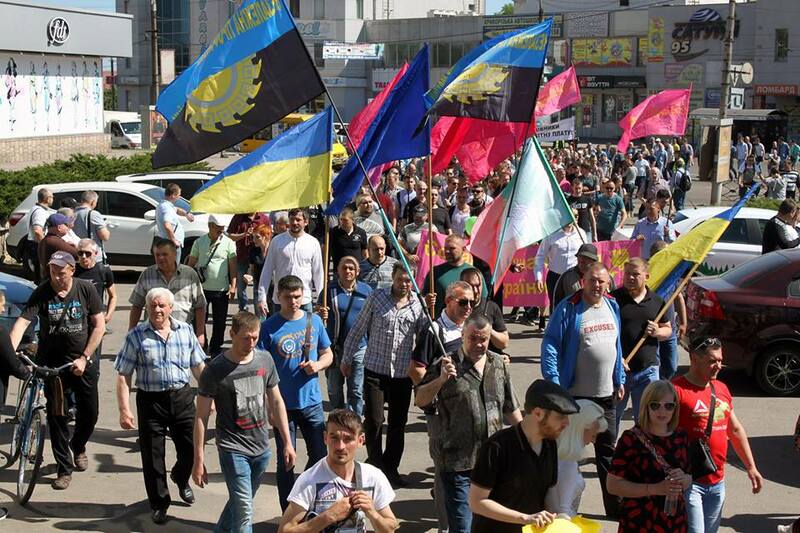 A pioneering May Day celebration was held in the city of Kryvyi Rih, a major industrial centre of Ukraine. Organised by the independent trade unions, miners, steel workers and radical youth marched through the city and held rally. After many decades in which May Day was a ritual of zombie Stalinists’, this rebirth of a May Day organised by the Ukrainian labour movement is to be celebrated. 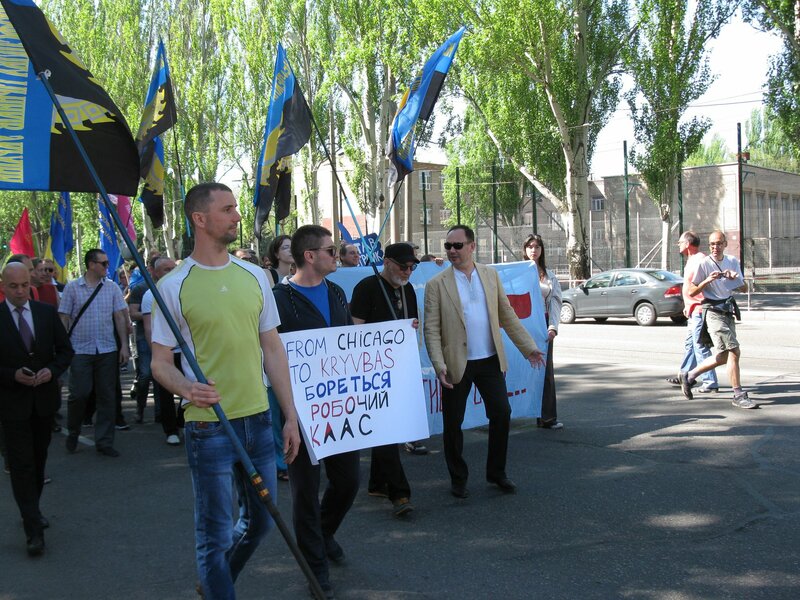 Kryvyi Rih has been a centre of independent trade union activity; they played a key role in the EuroMaidan rebellion in the city, they have challenged the oligarchic owenrs and are currently engaged in a major struggle with the global corporation ArcelorMittal. Ukraine Solidarity Campaign is building support for this struggle of the Ukrainian trade unions for better pay and conditions. We publish below the report by the Confederation of Free Trade Unions, as well as pictures and videos from this fantastic event. 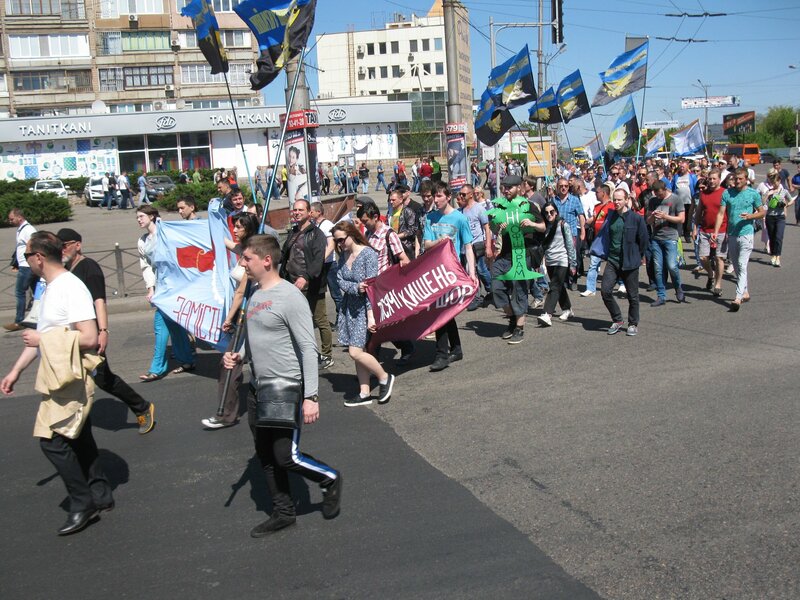 On 1 May workers and trade unionists took to the streets to celebrate the Labour Day and to demand respect labor rights, ensure occupational safety at workplace and salary raise in Kryvyi Rih. 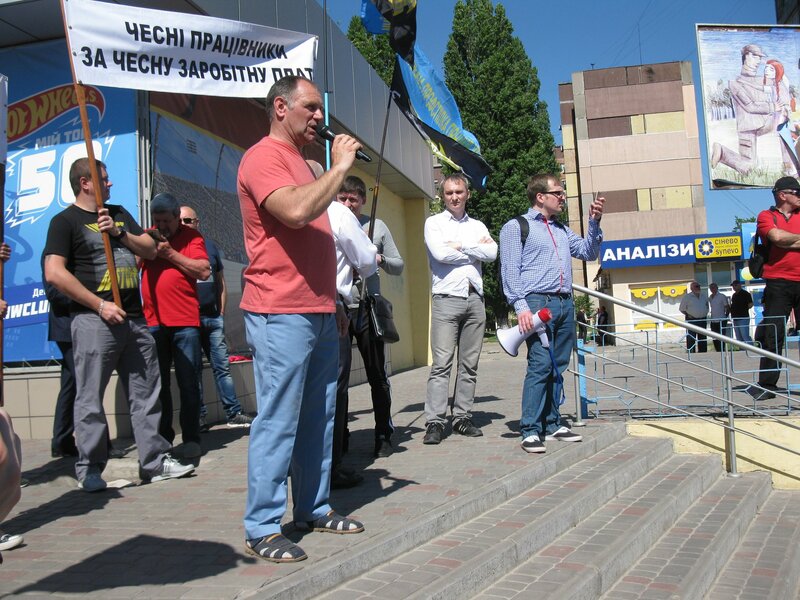 In particular, the representatives of the Independent Trade Union of Miners of Ukraine (NPGU) was co-organizers of this peaceful demonstration in the center of n Kryvyi Rih. It was joined by the members of the local organization of NPGU of enterprises ‘Sukha Balka’, ‘Kryvyi Rig Iron Ore Combine'(KZRK), ‘ArcelorMittal Kryvyi Rih’, ‘Northern Mining and Processing Plant’ etc. The protesters marched in the city center with flags and with signs that read “Fair pay for fair work”, “Workers Solidarity”. During the speeches trade union leaders and activists demanded to ensure the decent work and the decent life for all, stop using outsourcing for saving costs, providing the European social standards and raising salaries to 1,000 euros. During the speech, the Chairman of the primary trade union of NPGU at the РJSC “ArcelorMittal Kryviy Rih” Mykola Moriakov emphasized that workers should demand to ensure decent work. “Every one of us has the right to a decent work and decent salaries. Also, we have a right to work in safe conditions, that provides be Ukrainian and international legislation. But we see workplace safety violations and these cause threats to workers’ life and health” – said Mykola Moriakov. Representatives of the NPGU explained that the workers of local enterprises have been receiving a salary of EUR 1,000 until 2014. The international prices for iron ore have not changed since then, so low payments are provided only due to the situation on the Ukrainian labor market. Also, representatives of the NPGU urge Ukrainian government and parliament to withdraw the Draft Labour Code, as it violates the labor standards set by the International Labor Organization and narrow workers’ rights and threatens the existence of free trade unions in Ukraine. 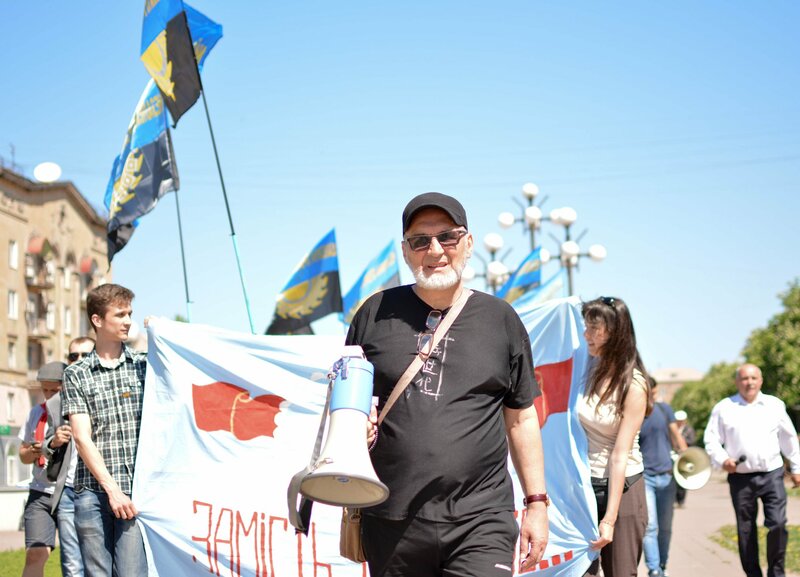 The Chairman of the Local organization of NPGU in Kryvyi Rih Yurii Samoylov calls on workers to organize and show their solidarity in the struggle for social justice. ‘We demand salary raise because workers deserve decent pay. And it’s very important for us to unite. I do believe in solidarity of workers of Kryvyi Rih, as well as Ukraine and whole world’ – said Yurii Samoylov.